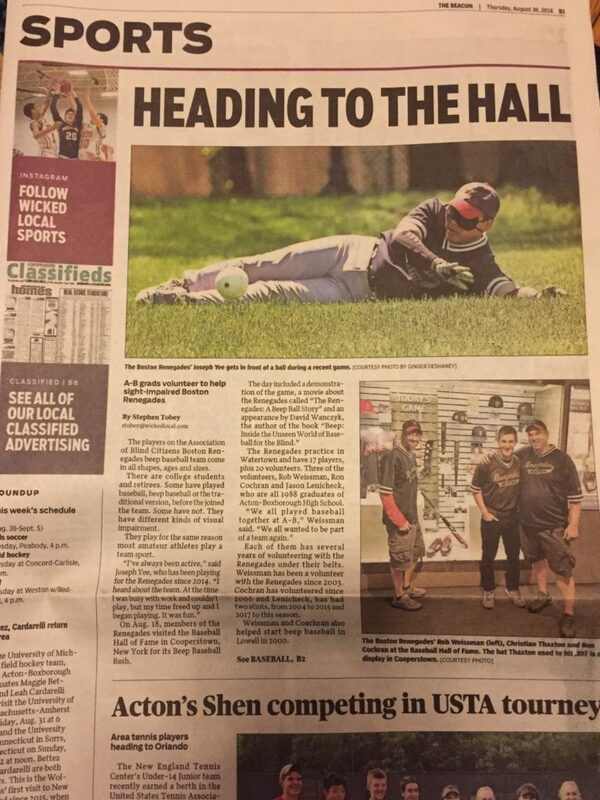 The Acton Beacon featured the Renegades in their paper on Thursday, August 30th. The Beacon is both a print and online resource that serves both the Acton and Boxborough community. They are part of the Wicked-Local community and the story got picked up by a few other towns in their on-line papers as well. Acton is an important part of the Renegades history. Three volunteers with a combined 45 years of volunteering for this organization hailed from Acton in the 1980’s. 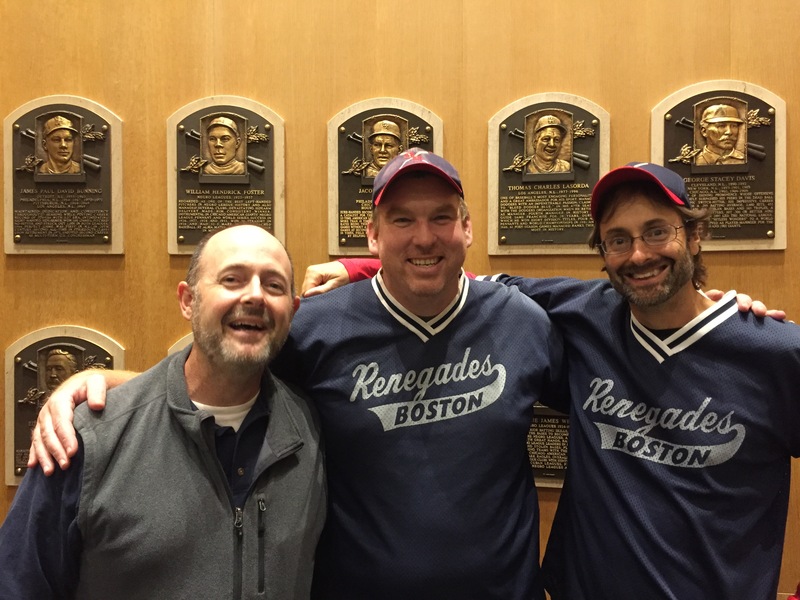 Rob Weissman, Ron Cochran and Jason Lenicheck all grew up on the little league fields of Acton playing with and against each other. They played for years into and past High School as well. Baseball has been a big part of their friendship. “Being able to coach/Volunteer with my lifelong friends has made this experience so enjoyable”, Weissman said. “When life finds a way to keep us all busy, we still find time to volunteer together. It becomes something which is more than volunteering, It’s an opportunity to hang out with our friends”. These three guys all had less than mediocre baseball careers. Weissman and Cochran played a ton of summer ball, but could not make the High School team in the highly competitive Acton-Boxboro sports community. Lenicheck did play some High School ball as an all-hit, error prone 3rd baseman. Nobody who ever played with them would ever think the National Baseball Hall of Fame would want them to put on a program for the day at the Hall of Fame. Though their baseball careers never took off, the skills they learned has made a far bigger impact on many lives. As Ron and Jason were unavailable for the interview, Joe Yee, one of the people impacted by these three guys, pinch hit and helped talk about the game, their impact and what the sport of Beep Baseball meant to him. Ron and Rob were also part of something special that happened at the Hall of Fame. One of their players, Christian Thaxton has his bat on display in Cooperstown as Christian set the league record hitting .897 in the 2017 World Series. In Beep baseball, the Pitcher and catcher are part of a team working with (as opposed to against) the hitter. In Beep baseball, the Pitcher and catcher are on the same team. Ron did an amazing job of grooving pitch after pitch in Christian’s wheel house. Weissman sat behind the dish and identified and set a target for Cochran to trust as well as making sure Thaxton was set up in the batters box in the right spot. All three of these guys worked together to communicate on timing and adjustments. All three of them were damn proud to see Thaxton’s bat enshrined in Cooperstown!